Sorry for the lack of posting at the moment. I've had this post in my drafts folder for the last week, but have been too busy to sit down and edit the photos. Work and a sick daughter have filled up my whole week and today has been the first time that I've been able to finish this post. 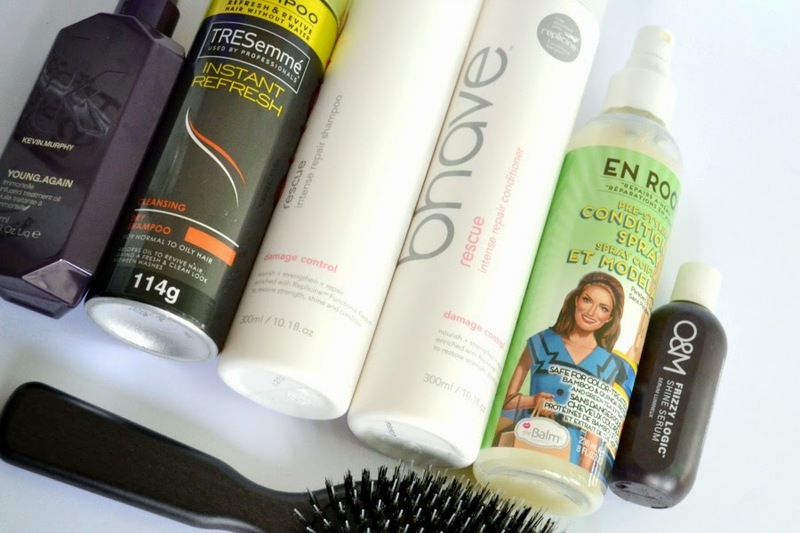 I hope you enjoy reading about what products I use every day/week on my hair. I'll be also doing an updated skincare routine later next week. I don't have a lot of time to do my hair, so I rely on products that are multipurpose and can tackle more than one hair concern. If you've read my blog even a handful of time, you would have seen me rave about this duo. 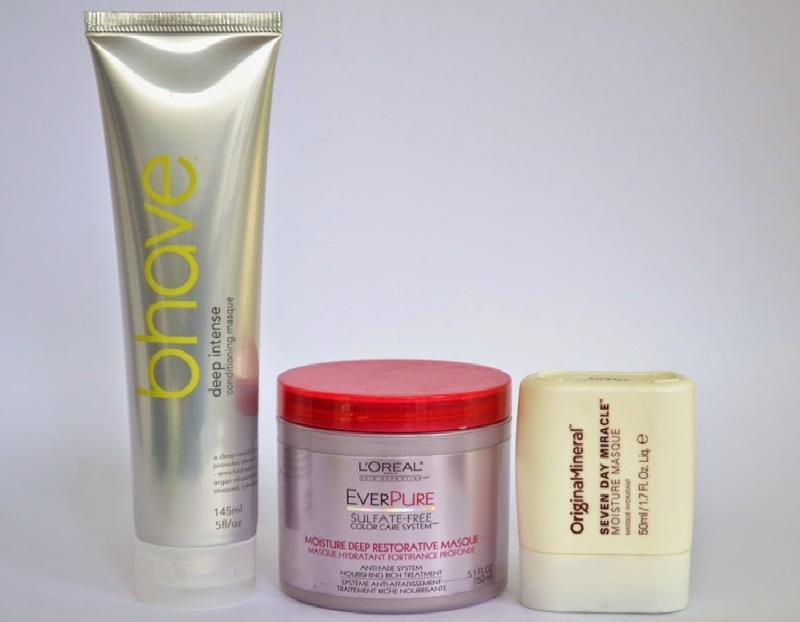 It's been over a year since I started using bHave products and I've never looked back. These have become a holy grail product for me! I have dry, damaged and wavy/frizzy hair and when I use these, my hair is softer, stronger, healthier and frizz free. I can use these (as well as a mask), pop in a hair oil or cream and leave my hair to airdry and I've finished. My hair looks like I've put in a lot of effort once it's dried, but in reality I haven't. I swear by this duo that I can't imagine not using these. They're pricey, but a bottle will last me about 5-6 months with 2-3 weekly uses. I have to admit, I rarely use a purple shampoo. I use one maybe twice a month. Since putting a water filter in the shower, I find that I get less brassiness and no longer get a green tinge from the chlorine in the water. It has been a lifesaver!! If you're blonde, you need to go to Bunnings (or your local hardware store) asap. 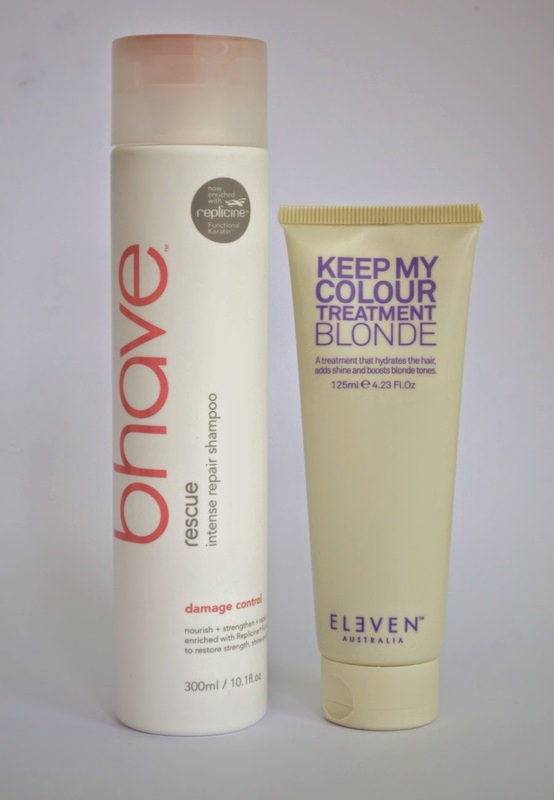 The blonde toner that I'm currently using is the Keep My Colour Treatment Blonde from ELEVEN Australia. And WOW!!! Firstly the scent is incredible. It's slightly floral and mostly fruity. If I could bottle up the scent and turn it into a perfume or candle I would!! You know I'm loyal to my bhave shampoo and conditioner, but if the ELEVEN Australia shampoos and conditioners smell this good, I may just cheat on them!! Because I have a (grown out) ombre thing going on, I apply this to the lower half of my hair where the blonde is. I will shampoo with bhave once, wash it out then apply more on my scalp. I will then use this on the blonde ends so I don't waste time doing an individual 2nd shampoo and then a toner. What I like about this is that I also get benefits of glossiness and moisture. It retails for only $19.95 and will last me about 8-10 months. This is the mask that I use when I want a deep hydrating mask. If I have the time to, I'll shampoo my hair and then step out of the shower and towel dry my hair. I apply this to my hair for about 20-30 minutes, get back into the shower to rinse it then follow up with conditioner. While this process takes a while, I like to do it once every 2-3 weeks. It helps to recover my hair from the daily wear and tear and heat styling. This mask can either be used as a quick 5 minute mask or applied to your hair for 20-30 minutes. It smells incredible and the scent lasts for hours in your hair. I like to keep a inexpensive mask on hand for those days when I have dry hair but don't have time to use a 20-30 minute mask. I've just run out of both the L'Oreal and O&M mask and have started using this Kevin.Murphy mask. It helps to both strengthen and moisturise your hair. It works in 5-10 minutes and leaves your hair feeling soft, smooth, frizz free and knot free. It contains Quinoa proteins to help repair and strengthen your hair. I'll be using this in conjunction with the bhave mask and alternating them. While everyone knows theBalm for their make up, they do amazing haircare too! This is a leave in conditioning spray which I use on damp or dry hair to add in moisture and help to detangle my hair. I never skip using a leave in conditioner as it helps my hair to deal with the day to day damage it goes through. It's a bit heavier than other leave in conditioners that I've used, so you only need a small amount. If you have oily hair, I'd skip using this. This has fantastic packaging (it's in a spray form so you can easily use it on the back of your hair) and it has a gorgeous scent. This is an amazing hair oil. It contains argan, coconut, avocado and sweet almond oil to help hydrate your hair. I like to apply this to my hair either before I wash it to protect it or after I've washed it to add a hit of moisture. Even though it's an oil, it doesn't feel heavy on my fine hair. This luxe hair oil both smells beautiful and feels amazing in your hair. I use this as both a styling product (for shine and softness) as well as as treatment oil. It's a bit pricier than some of my other hair oils (it's $49.95) but is worth every penny. To make this go further, I like to use this on the days that I'm working or have put effort into my hair. If I'm just staying at home, I'll use a cheaper option. This is the other oil that I've been using on the days when I'm just relaxing at home and don't want to waste the Kevin.Murphy Young Again oil. 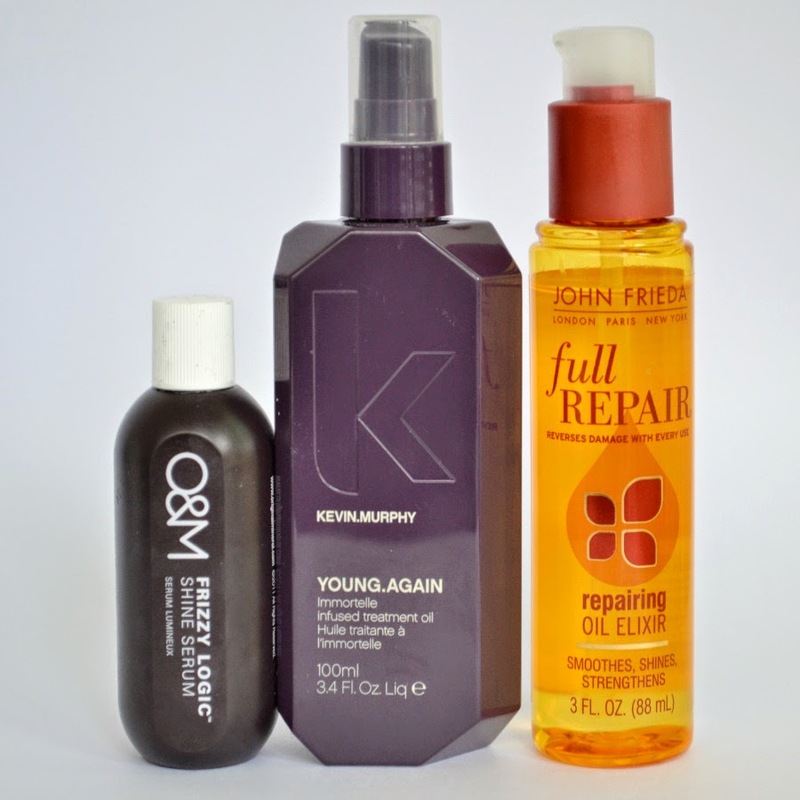 It's a lightweight oil that helps to strengthen and repair your hair. It also protects from heat styling. It's a budget alternative to the Kevin.Murphy oil. I have a few brushes that I use depending on what I'm doing to my hair. This is my detangling brush. I use it on both wet and dry hair. For me it's better than the Tangle Teezer. The short handle makes it easier to get the knots out of my long hair, especially the part at the back. 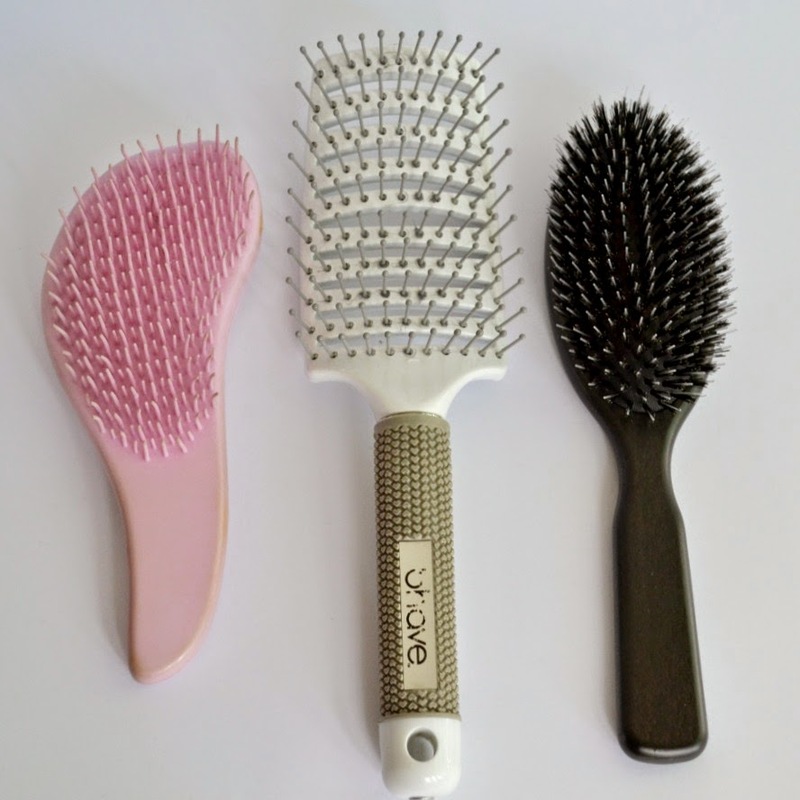 If I was to buy a new detangling brush, I'd buy this brush again over the Tangle Teezer. This was in the bHave Mother's Day pack (as seen here). It's a fantastic brush that I use to style my hair. It works just as well as the Macadamia brush in getting out tangles. I can't wait until they release a brush range as I've been obsessed with this ever since I received it. You know Cloud Nine for their heat styling products, but they recently released an eco-friendly, handmade, salon quality brush range which includes a paddle brush, this dressing brush, a blow dry bristle brush and a tail comb. Normally we scrimp on brushes, but when you think about it... it SHOULD be something we invest in (just like make up brushes). We use them multiple times a day and a bad brush can actually ruin your hair and cause breakage. This is a boar bristle brush that also has a blend of natural rubber. This blend makes it so much easier for me to use than other boar bristle brushes that I've owned. Some brushes have left my hair feeling fluffy, but this helps to also detangle it and leave it looking shiny. After using this, I now want to get the Paddle brush. And that's my everyday/every week hair routine. I haven't included any heat styling products since I don't use them often. I've put my hair through a lot of damage over the last decade with hair dye, bleach and styling so I try to limit my use of hair driers, curlers or straighteners for special occasions.